The organizing committee of Okaeri 2018 at JANM. Before Nov. 16, Alan Stonebreaker never imagined he’d meet other gay Nikkei. 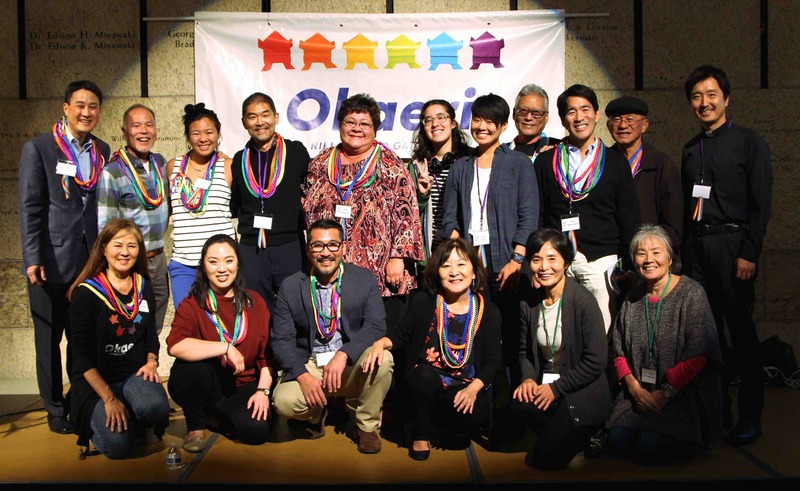 But Stonebreaker encountered dozens of other LGBTQ Nikkei at Okaeri 2018, a gathering at the Japanese American National Museum on Nov. 16-17 that attracted more than 250 LGBTQ Nikkei, their family and friends from across the country. A recurring topic throughout the weekend was the importance for LGBTQ Japanese Americans of receiving support from their families and the larger Nikkei community. That theme was apparent in two of four films about LGBTQ Nikkei that kicked off Okaeri 2018 on the evening of Nov. 16. In one of the films, “A Love Letter,” Okaeri 2018 co-chair Marsha Aizumi, the mother of a transgender child, explained that after she confronted her fears about gender variance and recognized that her child’s gender identity was not a choice, she made the decision to stand by him. The following morning, Lei Ueunten of Honolulu and JJ Ueunten of Chicago, a mother and child, shared during the opening plenary session about their previously strained relationship and subsequent reconciliation. JJ described feeling for years that Lei chose her religion over supporting JJ’s sexual orientation. And Lei, in turn, explained struggling to understand her queer child. JJ invited Lei to attended the first Okaeri conference, held in 2014, and was surprised Lei agreed to participate. At that gathering, Lei met Asian American Christians who embraced LGBTQ people. She reconciled her religious beliefs with accepting her child’s true self. In what was most likely the first-ever workshop in the U.S. for LGBTQ Japanese immigrants, more than 30 Japanese-speaking people discussed challenges facing gay and transgender Japanese immigrants. Several LGBTQ Japanese immigrants shared fears of rejection if they revealed their sexual orientation to their parents. Many LGBTQ people in the workshop agreed that the Japanese community hardly accepts, if not openly rejects, LGBTQ individuals. Okaeri, which means “welcome home” in Japanese, is a biennial conference. The previous gathering was held in 2016 at JANM. People from Southern California, Northern California, Seattle, Hawaii, Chicago, New York, Texas, New Mexico, Pennsylvania and Washington, D.C. attended Okaeri 2018. Alan Stonebreaker drove from Santa Rosa, Sonoma County. And what did he think of the event? For more information, visit www.okaeri-losangeles.org.